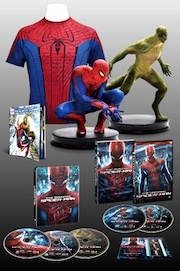 Spider-Man TM fans worldwide have less than 87 hours to jump on the opportunity to bid on The Amazing Spider-ManTM Real Hero Edition, a one-of-its kind, deluxe gift set to commemorate the release of The Amazing Spider-ManTM on Blu-rayTM and DVD (with simultaneous digital release) from Sony Pictures Entertainment Japan. SPEJ launched the auction through Yahoo! Japan auctions on Wednesday, November 14th, the same day the film became available for home entertainment. The gift set will be showcased at the Sony Building in Tokyo until Sunday, November 25th, however the auction ends just before midnight in Japan on Tuesday, November 20th. News Who Is The Ultimate Entertainment Game Changer? I long for the days of Matthew McConaughey in movies other than cheesy romantic comedies, but here's hoping this one is at least slightly better than most.